I thoroughly enjoyed participating in the Global e-Government Forum 2013 on Tuesday and Wednesday of this week at KINTEX in Ilsan, including chairing a panel entitled "Communication: Enhancing democracy through online participation." This post is prompted by a keynote address given on the second day of the conference by Chair and Emeritus Professor Ahn, Moon Suk of Korea University. In it, he enumerated some of the major success factors leading to Korea's current status as a world leader in e-government. I was pleased to see that he acknowledged the significance of the phonetic and very scientific hangul alphabet, along with the role of technocrats trained overseas, the shared vision of policymakers and opinion leaders, and the commitment of every president of South Korea. This last success factor is something I stressed in my October 15 presentation to ICT ministers from Latin America and the Caribbean in Seoul, using the accompanying slide as an illustration. (click to see a full size version) The blue line on the slide represents GNI/capita in current U.S.$ as reported by the World Bank. Over the years since 1980, South Korea developed many plans, some dealing with infrastructure projects and others more broadly with informatization. Among these plans, the two highlighted in blue on the slide deserve special emphasis. The 1981 "Long Term Plan to Invigorate the Electronics Sector," comprehensively addressed what we now recognize as the ICT sector, years before that term came into common usage by international organizations. It also addressed the question of financing from both public and private sources. 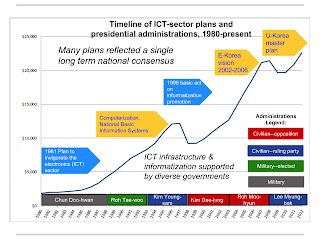 In 1996, the administration of President Kim Young Sam elevated informatization to the level of a top national policy priority, with the newly enlarged Ministry of Information and Communication (MIC) given overall responsibility for guiding ICT sector industrial policy. As Professor Ahn stressed in his keynote address, and as this slide illustrates for the period from 1980 to the present, every South Korean president has supported development of the ICT sector. Remarkably, this included military governments and, after democratization both ruling party and opposition presidents.